Trump Can Commit All the High Crimes He Wants. Republicans Aren’t Going to Impeach Him. Since the beginning of Donald Trump’s presidency, or even before, Democrats have been waiting for the moment when the Republican Party’s indulgence would snap. In every incremental advance of the Russia story, many hear the ticking hands of an “impeachment clock.” But there is no clock, and there will probably be no impeachment, at least not based on the field of Trumpian misdeeds currently at play. To imagine Republicans might turn on Trump over the Russia scandal to the point of deposing him from office is to misunderstand how they have been thinking about Trump and the presidency all along. Watch: All of the times Donald Trump has shown he’s his own worst enemy. The vast majority of the Republican Party has absorbed these developments, a numbing procession of leaks and shocking news developments, with no diminished confidence in Trump whatsoever. “I travel in this state every single day — top to bottom, east to west, big cities and small towns, and I have yet had anybody come up to me and say they’re worried about Russia messing with our elections,” says Republican senator Luther Strange of Alabama. “I have no doubt that Russia tried to meddle in our election. They’re going to continue trying to — just like they have my entire lifetime.” Others have shifted the focus to nefarious “deep state” bureaucrats who have found the incriminating evidence. Both these arguments are ways of saying that any actions by Trump and his staff are benign by definition, and any evidence of crimes he has committed is actually evidence of crimes committed against him. Other Republicans have expressed unease with the president. This group appears on the surface to present a greater danger, and has attracted wide attention for their occasional scoldings of Trump. But the only Republicans who have criticized Trump for his corruption and abuse of power are the ones who have opposed him from the beginning — mostly intellectuals and pundits who do not work in Republican politics or conservative media. When more loyal Republicans have criticized the president, they have aimed more indirectly at his communication style and disorganization. The Journal’s editors do not mention that they too gamely toed the initial, obviously absurd Trump party line that the administration only fired Comey at Rod Rosenstein’s behest. While they obviously feel humiliated, the Journal’s editors aren’t complaining about Trump firing the FBI director for investigating him, or even that he Trump lied about it. The complaint is that he stopped lying about it and made the people who endorsed his lie look silly. While it may seem puzzling to liberals, this kind of behavior is consistent with the method of the conservative movement. The conservative movement takeover of the Republican Party began in the 1960s and took decades to complete. Conservatives still have not lost their sense of being an insurgent movement that might at any moment be betrayed by the party Establishment. Conservatives think of their role as quasi-independent, but they also imagine it as focusing exclusively on enforcing fealty to their doctrine by politicians who might otherwise be inclined to wander. The scenario they are built to fight against is the Republican president who colludes with Democrats, not one who colludes with foreign dictators. If the president is fighting against the opposition party, they assume he is acting correctly. Conservative organs like National Review originally viewed Richard Nixon with hostility, and — perverse as it may sound — came to his defense because of Watergate. Many conservatives opposed Trump during the primaries because they suspected, with good reason, that his conservatism was shallow or insincere. They worried that, once elected, Trump would abandon their priorities and pursue the most expedient course. But Trump has not done that at all. The policies or talking points Trump has abandoned are the centrist ones: He would protect Medicaid from cuts, give everybody terrific coverage, hammer the big banks, spend a trillion dollars on infrastructure, and cut deals with both parties. This week, Trump formally abandoned the last possible area of ideological compromise in infrastructure, “clarifying” that his plan relies on private industry, states, or cities ponying up the money. Trump’s budget actually cuts federal investments in infrastructure. 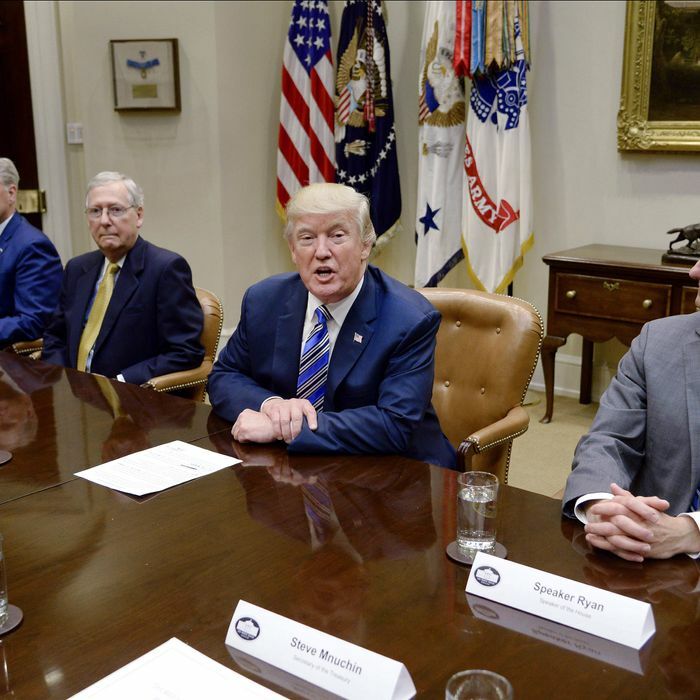 He has positioned himself to the right of even House Republicans on domestic spending, and continues to push for their grossly unpopular plan to cut a trillion dollars from Obamacare. “The Never Trump conservative argument that Trump is not a conservative — one that I, too, made repeatedly during the Republican primaries — is not only no longer relevant, it is no longer true,” points out the popular conservative talk-show host Dennis Prager. Trump is faithfully supporting the conservative agenda, so most conservatives faithfully support him. Their concerns are pragmatic ones about his effectiveness on behalf of their common agenda, rather than moral objections to the legitimacy and propriety of his actions. Trump may have committed impeachable offenses, but the impeachment clock has not even begun to move.